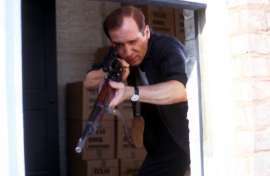 Within seconds of meeting the Red Dwarf posse, Lee Harvey Oswald was left hanging on for dear life. Toby Aspin explains the fine art of playing history's most notorious patsy - for laughs. I got thrown out of school! (Laughs) My mum taught drama, my family are all very academic, [but] I always wanted to [act]. I did the school plays, I won the drama prize, I won the music prize, I got thrown out - so it all pointed in the right direction! Then I thought I'd try to do it for a living. I drifted south - because I'm from Stoke originally - and tried to find agents. You spend 90% of the time finding the work and 10% doing. That was Grange Hill. I did about eight episodes of that. I did the whole [audition] in a cockney accent rather than say, 'Oh, I can do a cockney if you want me to'. They gave me the part. Then it was The Bill, then it was some Crimewatch thing, then loads of plays after that. Do you remember Tucker's Luck? There was serious, serious, grown-up talk of having a spin-off with me and Robbie, doing a similar thing on BBC2. We had meetings, it just never happened. How did the RED DWARF job come to you? I belong to a mime agency, I do a lot of physical theatre. I was surprised you could get so much work in mime, I thought mime was just [part of the] fine arts, [that] you weren't going to get any commercial work out of it. I've had more work from that in the last two years... I've been flown to Turkey first class, five star hotel, just to do that (twiddles fingers) on a computer keyboard! They just wanted someone who could roll out of windows without cracking their neck, basically! (Laughs) I had to mime with the gun - and there is no way that Lee Harvey Oswald could have shot JFK. I had a gun that was the sister of [the weapon used] - one soldier standing here, one soldier [armourer] standing there - and between each shot you had to pull the thing back to let the shell come out. It takes about three seconds if you're really fast, and you've got to aim and point. There's no way he could have done it, you can't click it back fast enough. Did you find the costume and make-up an eerie experience? [The set] was wheeled outside! On the telly you see it five stories up, but that was added cleverly, digitally. I was actually that far off the ground (he says, holding his thumb and finger close together). The ledge was very wide, very safe; there was no way I could fall six inches to the ground... to my death. I had to make it look very narrow - my feet had to be quite a long way out, and I had to pretend I was really scared, looking like I could slip off. All that slipping was just added to make it look dangerous... fortunately I've got big feet. You don't want to make a fool of yourself in front of all the nice people. I just sort of hoped I'd get it right. They were very nice, actually, everyone was concerned and standing by in case anything went wrong... probably for insurance reasons, but I took it personally! (Laughs) I wish there had been more [takes] actually. Telly - unlike film - seems to turnover very fast, and they covered it with, I think, two cameras. What's been your top time as an actor? I loved Red Dwarf, actually! I'm not a sci-fi person, [but] I've ended up doing loads of sci-fi things. I never watched Red Dwarf that much until I was in it. The people were so great, just really easy to talk to, not stuck-up. They talked to you like you were one of them. Then I started watching it. My flat mate is a mad fan. She's got all the videos - so they're there for me to watch! I thought the team did really well, getting JFK to shoot himself. 'It'll drive the conspiracy nuts crazy, but they'll never figure it out.' It was a really tight script, and I thought it was very well done. Let's talk about the DR WHO videos - which are kind of 'unofficial' extensions of the show. How did you get involved in those? I knew some people and I fit into a Dalek costume... and I fit into a Sontaran costume, and I've been shot by a Dalek... Daleks are funny. I used to be scared of Daleks when I was five! I assumed there was an engine and you just sat in there - nothing could be further from the truth. You've got a big, wooden casket. You can't put your feet in front of you, you've got your sink plunger and your whisk, and your eye on a wooden thing, [plus] two tiny wires that you put together for the flashing lights! This is a video spin-off from the fan club. I know a guy with a TARDIS in his room. He sleeps with his feet in the TARDIS! This [video spin-off] is sort of 'enemies of'. The Doctor doesn't appear - but everyone else but [does]. What did you play in THE BILL? I was a TWOC-er [Taking WithOut Consent], I stole a motorbike. I've always, always been a baddie - a nice guy like me! Always a killer or a baddie or a thief or something. Not even a loveable baddie. Mr Flibble enjoyed talking to Toby Aspin, and now that it's over... Mr Flibble is very cross.